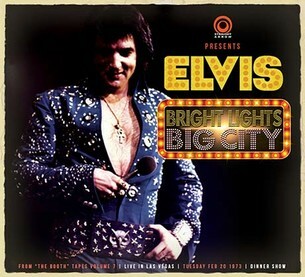 Nevertheless, the Feb. 20th, 1973 D/S is another completely new concert recording, even for die-hard Elvis fans. It has never been in circulation - in any form, and the sound quality is exceptionally good! Ask your local dealer for samples! As usual, our new release is presented in Straight Arrow's standard deluxe digipack. Since there is a hand written notice on the cassette label: 'Blue Suit / Silver Stars”, the producers assume that Elvis appeared in the 'Owl suit' - the only blue jumpsuit designed with silver stars. For this reason, we have decided to design the digipack with a collection of photos of Elvis wearing the 'Owl suit', as taken in November 1972. Thursday, February 20th, 1973 Dinner Show, Las Vegas Hilton Hotel, Las Vegas, NV. 01. Orchestra Intro - 02. Introduction: Also Sprach Zarathustra - 03. C. C. Rider - 04. I Got A Woman / Amen - 05. Love Me Tender - 06. You Don't Have To Say You Love Me - 07. Steamroller Blues - 08. You Gave Me A Mountain - 09. Fever - 10. Love Me - 11. Blue Suede Shoes - 12. I’m Leavin’ - 13. Hound Dog - 14. What Now My Love - 15. Suspicious Minds - 16. Introductions of singers, musicians, orchestra - 17. Introduction of actor George Montgomery - 18. (Let Me Be Your) Teddy Bear) / Don’t Be Cruel - 19. Can’t Stop Loving You (with false start) - 20. An American Trilogy - 21. Can't Help Falling In Love - 22. Closing Vamp / Announcements.